That was the first comment we received after the premier of Madhouse in class. For a while the class was speechless. We had made a miraculous comeback since our bumpy start. Slowly, the class began to fire questions. We elaborated about environment of Lockwood Manor Mental Facility, the voice over, and the narrative. Since its premier Madhouse has been incredibly successful. At the time of writing this we have nearly 400 views on the itch.io page and similar numbers on the release trailer on YouTube! However, as with any project, it never goes perfectly. I'm no exception to this rule. There's some things I did well, some things I could have done better on, and plenty of things I would adjust if given the opportunity. So, here's the postmortem as it pertains to my own role in the project. 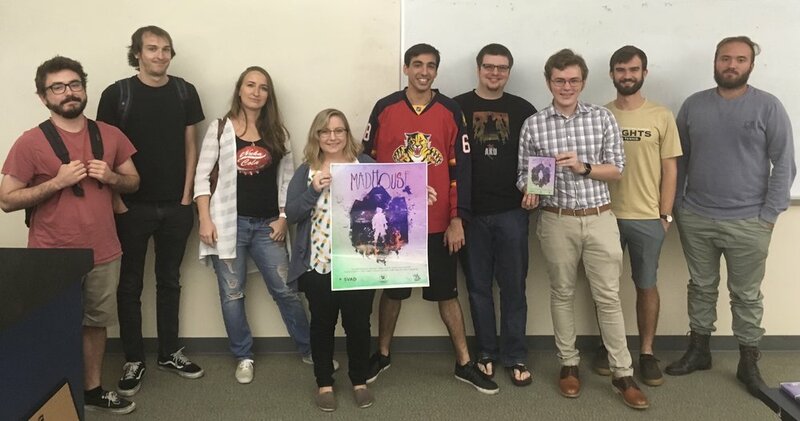 The team after presenting the final build of Madhouse! Where I succeeded: To get a good scope of what others think of my skills as a producer, I asked them directly to give me 'highs and lows' for the duration of our project. The highs seemed consistent across the board. My role as sound designer seemed to surprise the team. From the beginning we were worried about how difficult it is to create quality sound for horror media. Much of the team felt I succeeded at a very difficult task in Madhouse. Another prolific comment was a complement of my organizational skills. My ability to keep everyone on-task, track their hours, and make sure the game was on track is something I'm very proud of. Lastly, the team mentioned my commitment to documenting the project. Game Design Documents, Dev Blog Posts, and Burndown charts kept the whole thing on track. After all, documentation was a core responsibility of mine on Madhouse. Where I failed: There were a few aspects of development that, because of my inexperience, led to some bumps in the road. While the team agrees we had a miraculous recovery, I'd be remiss if I didn't address them. First and foremost is version control. In August I had no experience whatsoever with server administration and version control maintenance, but because we collectively decided to pursue Unreal Engine I had to learn. The learning process was a slow one, and we lost out on countless productive hours because of it. I’ve learned from this mistake, and I’m fortunate I had the opportunity to educate myself before I get any further in a career as a developer. My team unanimously mentioned that I could be stricter on my teammates. At the beginning of the semester I drafted a contract with disciplinary action for teammates who did not complete their work. Over the course of Madhouse’s development, I learned my contract was far too relaxed. As always, I take my previous documents and iterate them to improve over time. The contract is no exception, and come Spring 2018 I hope to not have this issue at all. What I should change: A few team members advised me to “Keep doing what you’re doing,” but that’s too easy. I know there are adjustments I can make to improve my role in future groups I’m a part of. First and foremost is playtesting. 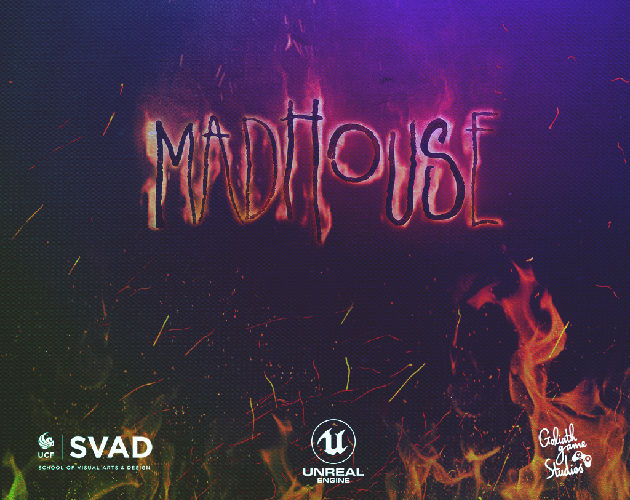 Because of the rapid pace of school projects, we had very little time to playtest Madhouse, and I will absolutely be prioritizing the testing phase from now on. I’ve learned so much from my time on Madhouse, and much of that knowledge is on better ways to implement audio. Because Unreal Engine was a new experience for Goliath Game Studios, none of us truly knew what to do. For me that meant simply throwing in audio however I could and duct-taping it together later. That’s a pitfall I hope to avoid. I’ll be researching carefully how to cleanly implement voiceover and sound effect sequences for future projects. I’ll be enjoying the holidays over the next few weeks. Expect a new project to begin in early January. Follow my Twitter for frequent updates!